It is not difficult for someone to search online for one piece action figures. In fact, it is really easy to find numerous products online all over the place. But how do you differentiate what’s worth it and what’s not? That is exactly the purpose of this series of posts. We are going to recommend only the best of the products that exist online, so you don’t have to rely on guesswork. So without further ado, lets dive right into the best picks for today’s post. The first pick belongs to the company Megahouse, one of the best in the marketplace right now. It would be a shame if we didn’t start our recommendations with the protagonist of the anime/manga, our beloved captain Mugiwara. We are featuring here a tall 7 inch action figure of high quality. However, for those with a tighter budget there are some cheaper alternatives to consider. If you are looking for something noticeably bigger, you can always go with Banpresto’s 10.25 inch figure, whose attention to detail makes it a must have for every collector. Don’t buy this figure for any child below 3 years old, because the danger of choking is quite high due to its small parts. (that goes for all our action figure recommendations, because they all contain small parts). We also have to include a smaller option at 5.5 inches, which comes straight from Bandai Tamashii. 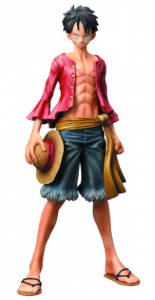 This 5th anniversary action figure comes with a nice display base and if that’s not enough, you can also adjust Luffy’s hat by placing it either on his head or on his neck. Quite cool if you asked me. 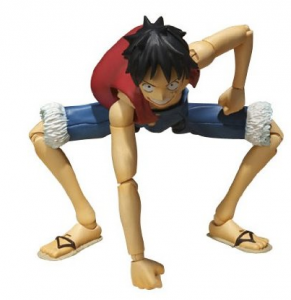 Our last pick regarding Luffy is for those that don’t want him standing basically :P. Another action figure from Bandai that basically features Luffy ready in his stance for Gear Second! 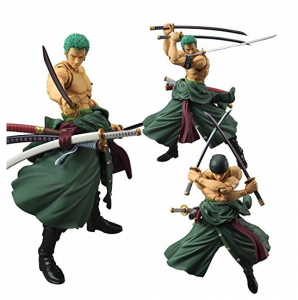 Lets follow the crew’s strength and continue our suggestions with the strongest swordsman that can’t follow directions, Roronoa Zoro. Another quality figure from Megahouse here, i believe even better than that of Luffy. 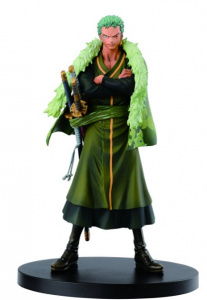 You can have different heads for Zoro(with his bandana or not), and i didn’t tell you my favorite. He can hold his sword in his mouth! We are talking about an 8 inch figure here, made of PVC. We also have an interesting and more artistic alternative here from Banpresto, that collectors may want to consider instead of Megahouse’s. It is quite similar in height(7.9 inches), and the artwork here is i believe top notch. For another smaller alternative, someone can check out the following figure from Banpresto again. At 6.7 inches, this 15th anniversary edition might exactly be what the collectors among you may be searching for. It is a quite cheap alternative as well. Lets start off, with another Bandai Tamashii pick. With interchangeable hand parts included, and flaming foot effect parts as well, this one is a quite decent choice if you asked me. It is 5.5 inches tall and made of PVC. 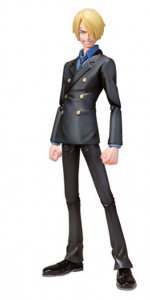 A taller alternative is the Megahouse Sanji action figure. It stands at 9 inches and his arms can move whatever way you like. The thing i love about this one is the way Sanji holds his cigarette. Badassery on steroids :D. There are also different face styles available for our favorite cook. 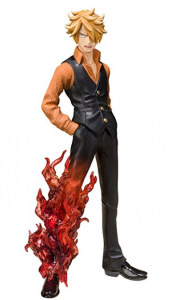 My personal favorite is the next battle version of Sanji, which features his leg ablaze. A spectacular design for anyone who wants something different from the typical. It is a small figure at 5.5 inches. I want to end this post with some of my favorite picks, that are somewhat different than the ordinary one-character action figures we already discussed above. 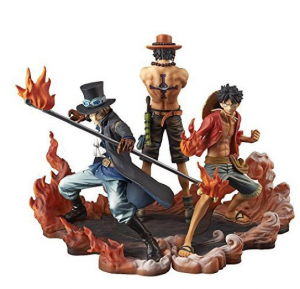 An unbelievable action figure set consisting of the three brothers in law, Luffy, Ace and Sabo, all in one purchase. It is a choice that can save you money as well, because you get all three of the figures at the price of one. The artwork is beautiful with dimensions of 5.5 inches for Luffy, 6.7 for Portgas D Ace and 5.9 for the revolutionary Sabo. This one is a Banpresto action figure set. I couldn’t keep myself from recommending an action figure for the perverts among you. And who is better than the Pirate Empress and member of the Shichibukai Boa Hancock? 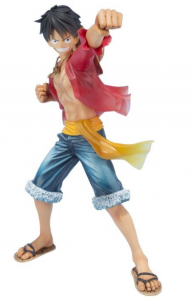 The woman in love with Luffy is more beautiful and stunning than ever in this action figure. Were you inspired by the Dressrosa Arc? Well, i was too. 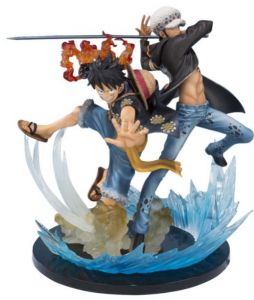 In this action figure set, of two this time, we can see Luffy along with Law in an exciting battle stance. A Bandai Tamashii action figure set, with a height of 9 inches, this stunning miniature is a must have for everyone who loves a good anime arc reference. After all, it is the way they entered the battle together at Dressrosa. I’m already excited! Characters are nice and well, but what about our favorite ship? 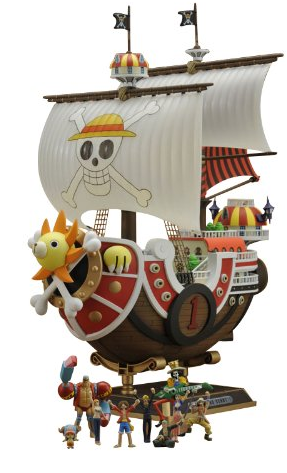 Well, here we have an unbelievable figure of the Thousand Sunny at a very low price. And the best thing about it is that it saves you even more money. How? Mini figures(unpainted though) of the Straw Hat pirate crew are included as well. 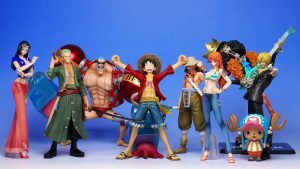 Ever wanted cute mini figures of Luffy, Zoro, Nami, Usopp, Sanji, Chopper, Robin, Franky and Brook? They are all included in a package with the Thousand Sunny parts(yes you have to assemble it) with a nice display base as well. Well, that was it for today’s picks. 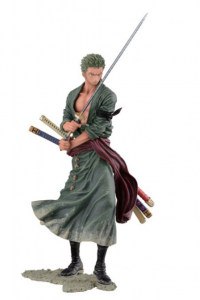 I would really love your feedback on my One Piece Action Figures recommendations. Which ones do you like and which ones do you absolutely hate? Give me your favorite picks as well. 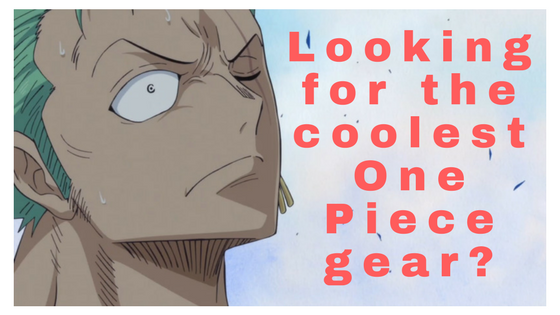 p.s Don’t forget to like our facebook page for updates and visit our recommendations page for similar One Piece goodies! Cheers! 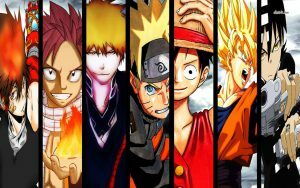 I really like One Piece and other Manga series like Naruto and Pokemon. As a child I always wanted action figures from my Anime heros like Zorro from One Piece or Kakashi from Naruto, but I never found them in shops. These days, with Amazon, it seems to be easier to find these figures! Hello Mike, glad to see a fellow anime/manga enthusiast here. I also love Naruto and Pokemon, not only One Piece. Glad you liked the suggestions. Cheers! My son likes anime, and will watch it for hours. If I could get to these recommendations through your site, that would be nice. Hey Becka. If you enter our recommendations page you will find links to our product reviews. From there all you have to do is check the review and click the link of each product. Previous Previous post: One Piece Shichibukai – Who is the 7th? Next Next post: Cipher Pol One Piece – Who are they?